With Americans eating 50 billion of these ubiquitous, hand-held, and versatile belly stuffers a year, burgers are a perennial sandwich favorite. Defined as a round patty of beef between two halves of a round bun, the hamburger lends itself well to take on trends and transport new flavors. Boujee Burgers: Burgers for 2018 are indulgent and upscale with a variety of toppings, including goat cheese, truffle oil, foie gras, aolis, marmalades, sautéed spinach, havarti, candied bacon and other healthy and exotic toppings. Not surprisingly, these boujee options merit higher menu prices. Portions of All Sizes: 2018 is the year for everything from giant, premium burgers to sliders and mini-portions. Global Themes: From bold Mexican and Asian flavors to Korean, Greek, Cajun, and more. International flavors are hot and growing, and the burger is the perfect vehicle to test drive and transport many flavors. Sriracha anyone? Fancy Buns: Artisan, brioche, potato, savory, sourdough, ciabatta, focaccia, pretzel, and more. The buns are fancy and the options nearly endless for 2018. Protein, Protein, Protein: Restaurants are beefing up menu language to highlight protein grams and adding protein topper boosters such as pastrami, bacon and pepperoni, as well as including lettuce wrapped options to increase the protein to carb ratio. Eggcellent Burgers – In line with the trend for more protein, eggs are topping off many burgers for 2018. 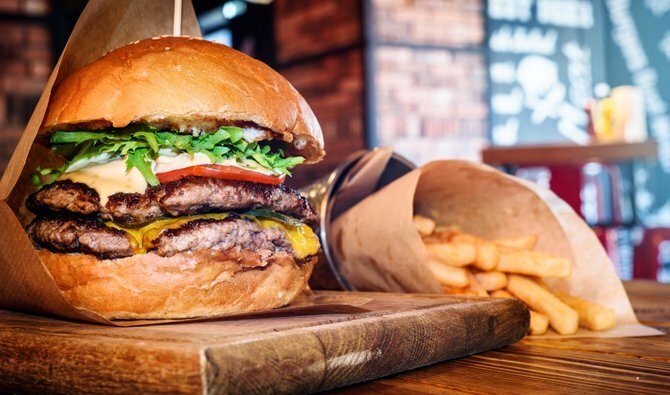 Millennial Marketing: This largest age segment of the American population is driving burger trends now and certainly into the future with their desire for global flavors, snack-sized portions (sliders), and healthy options and toppings. Healthier Mindset: From emphasizing and bolstering “protein” on menus, consumer geared messaging is also focused on other health oriented topics and features, including grass fed, organic, natural, gluten free, naked (no bun), and more. We are also working with customers on additional blends, which can include anything from adding mushrooms or quinoa to existing burger blends and other plant-based options. Burgers for Breakfast. We are definitely seeing more burgers for breakfast in 2018. From the breakfast burgerito including a halved beef patty, hash browns, eggs, onions and peppers all wrapped up and cozied in a flour tortilla to burgers and waffles, pancake burgers, hashbrown burgers, and more. Beef. It’s not just for dinner anymore. “The burger epitomizes the perfect vehicle to adapt to new trends and international flavors. As one of the largest processors of ground beef in the United States, we love working with customers to develop new blends and visions for this American staple” stated Collette Kakuk, Vice President of Marketing and Business Development at Sterling Pacific Meat Company. With Americans eating enough burgers to circle the earth 32 times each year, we see no end in sight for the endless ways this versatile staple can be served. Are you a restaurant, chain, or other food service company interested in protein solutions for your business? Let us put our over 40 years of experience to work for you. Contact us at matt.cullen@sterlingpacificmeat.com or collette@sterlingpacificmeat.com.